Winter takes parents by storm, and before you know it, your kids are in need of some warmer clothes and boots. If your child is a fan of snowmobiling and needs some new boots, you'll want to know where to shop and what to look for. It turns out that there is a specific niche market for snowmobile boots, but they are rare to come by, and according to Safe Riders, some high-quality winter boots will fare just as well. However, you should know your options before running out and buying a pair. You can choose the right pair of snowmobile boots by keeping these features in mind: water resistance, traction, comfort, and warmth during the extreme cold and windy rides. Check out your local stores or shop at one of these online retailers. Up North Sports is a rare site that offers youth-sized boots explicitly designed for snowmobiling. The site also offers these high-quality styles at affordable prices. XR Youth Shredder Boot: This all-black FXR youth boot features lower polymer and nylon upper construction. It is waterproof and made of lightweight EVA material. This boot will keep your child's feet warm in conditions down to -22 degrees Fahrenheit, and it has a drawstring top that helps keep out snow. It also has skid-resistant traction that will help your child get on and off that snowmobile. These boots come in sizes 1-5 and are around $45. Baffin Youth Young Eiger Boot: The Baffin Youth Eiger Boot comes in youth sizes 1-8 and costs around $80. It is made out of microfiber, nylon, and has a TPR shell, which will offer your little snowmobiler extra layers of warmth and waterproof protection. 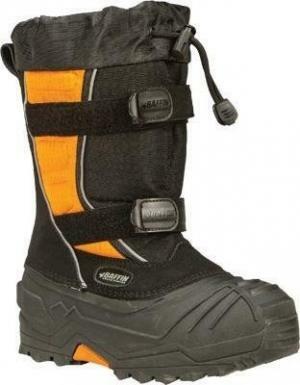 This boot also has hook and loop straps and a bungee lock snow cuff that keeps water and snow out. They are easy to slip on and are an aesthetically pleasing orange and black. One of the best aspects about this boot is it will keep your child's foot warm in temps down to -76 degrees Fahrenheit. Kohl's has quite the variety of kid's winter boots. Known for their mix of decent prices and durable clothing, Kohls might just be your next stop as you make the search for your little one's new pair of boots for activities like snowmobiling. Columbia Kamik Powdery Girls' Waterproof Boots: The Columbia Kamik Powdery Girl's Waterproof Boot is a stylish pink or black boot with a gray faux-fur interior. The waterproof material and inside cushion make this boot warm and comfortable. It also features a removable Zylex liner and rubber outer sole to protect your munchkin's precious feet. This boot is around $65 and comes in sizes 10T, 1, 5, and 11. 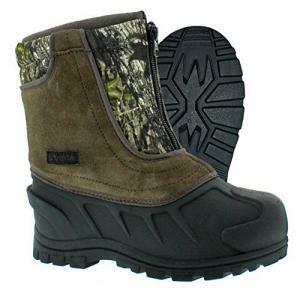 Itasca Snow Stomper Boys' Waterproof Boots: This high-quality boot comes in camo, blue, or black and the entire outer layer is waterproof. Made of suede and nylon with a TPR outsole, these heavy duty boots will be perfect for your boy on a winter day. The sole also features an intricate tread that will prevent him from slipping on icy surfaces, which is excellent for snowmobile use. The boots also have a round toe and zipped enclosure, so you don't have to worry about the laces. These tough boots cost around $50 and come in sizes 1-13. The Sierra Trading Post is a site that offers winter apparel at discounted prices. The catch: sometimes sizes and colors are limited, but this is a place to check out some quality name-brand boots for less. Kamik Moonracer Snow Boots: These girls' boots that come in pink and purple protect your little nugget's feet down to -41 degrees. They feature a heat-reflective footbed and faux-fur lining for warmth, protection, and comfort. The adjustable bungee laces offer a snug fit, and the synthetic rubber outer sole with a durable tread makes it easy to walk along slippery surfaces. These retail for about $65, but the Sierra Trading Post often has them on clearance. They also are available in more sizes and colors here on Amazon. Kodiak Emma Hi-Cut Plaid Flannel Snow Boots: These Hi-Cut and stylish gray and black plaid boots are waterproof and have a Thinsulate lining to keep your little girl's feet both comfortable and warm. They also come with a convenient, removable inner sole and no-slip rubber outer sole. The no-tie drawcord lace system makes them easy to slip on and off while the gusseted tongue keeps out moisture and debris, so there's no worry about her feet getting wet while on a snowmobile. Priced around $40, these boots come in kids sizes 1, 2, 3, 11, and 13. 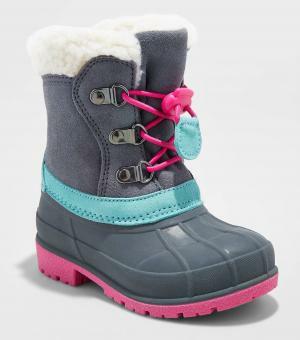 Target offers a wide selection of snow boots for kids. Known for affordability but quality materials, Target is a great place to buy your child's next pair of boots. Boys' Newman Performance Winter Boots: Looking for some rugged snow boots for your boy? Then look no further than the Boys Newman Performance Winter Boots. 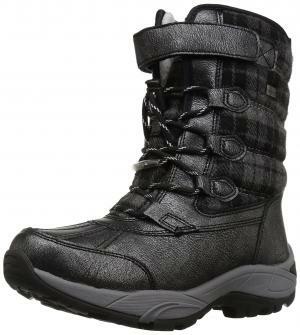 These durable black boots with a Velcro top enclosure and toggle laces are a comfortable fit for your little explorer. Lined with polyester and with a thick sole, this boot is built to last. They come in kids' sizes 1-6 and cost around $35. Toddler Girls' Mora Suede Bungee Boots: These Toddler Mora Suede Winter Boots will provide your little girl with comfort and class. This boot features pink and blue trim and a bungee tie that makes the boot easy for your little tyke to slip on and off while also providing a snug fit. Not only are they stylish with their mix of gray, pink, and teal, but the sole is constructed of leather and rubber that keeps the snow and water at bay. These boots come in XS-XL and are around $30. Amazon isn't one of the most popular online stores for nothing - they offer an extensive variety of kid's snowmobile boots that range in brands and prices to fit both your child's unique needs and your budget. 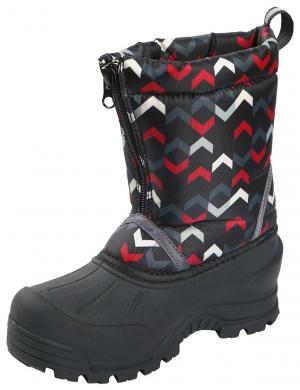 DREAM PAIRS KNOW Insulated Boots: These Dream Pairs insulated waterproof snow boots are stylish for both boys and girls. These boots come in many designs with faux-fur lining and a small pocket on the side as a neat accessory. These boots will keep your child's tootsies warm down to -21 degrees. The waterproof nylon and one-tug bungee lacing system make these boots weather-resistant and cozy for your child's frequent outdoor use. Priced around $28, these boots come in sizes 9-12 toddler and 1-6 kids. Northside Icicle Snow Boot: If you are looking for a solid winter boot with affordability in mind, then look no further than the Northside Icicle Snow Boot. Priced around only $11, these boots come in sizes for tykes ages 1-4 and an eclectic mix of colors and designs. This boot features a toe guard, high-traction sole, and classy zip-up insulated outer layer. The QuickDraw lacing and synthetic soles make this a high-quality boot without the price tag. There are many designs and colors for snow boots. A lot of this has to do with personal taste and the personality of your child, and virtually any color or pattern is fine for snowmobiling. One extra feature in the design to look for are reflectors. Although they are rare to come by, boots with reflectors offer snowmobilers an extra layer of safety. This is one of the most important features to consider. A snowmobile boot needs proper insulation for warmth. Common insulators include faux-fur, authentic shearling, interior cotton inserts, or a Thermolite inner boot. Most boot manufacturers tell you to what temperature they keep feet warm. This is an important fact to note as some insulators are better than others. For snowmobiling, you want to shop for a boot that keeps your kids' tootsies warm to at least -20 degrees, though many boots go even lower. Most boots offer good traction and are made of quality rubber. It's important to make sure this material is waterproof and to check the bottom of the boot to make sure the traction design will prevent your little one from falling. Some boots even advertise anti-slip traction. If a boot has a sole without tread - and some do - avoid it. It's not only important to find waterproofed material (usually indicated by the manufacturer), but it's also important to look for gusseted tongues, top closures, and zip enclosures that all work to keep water away from the boot wearer's vulnerable foot. 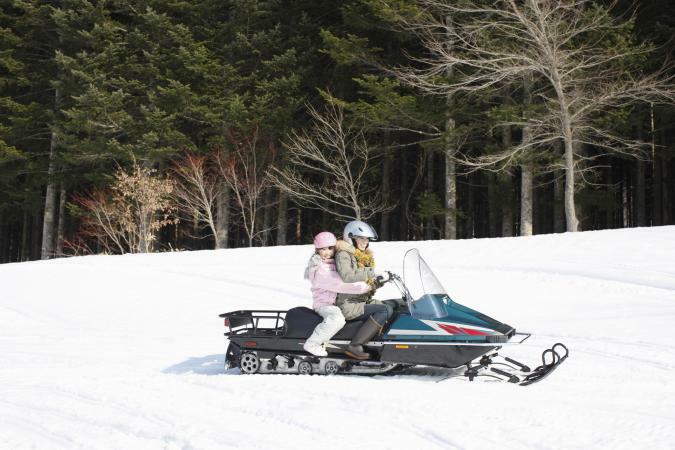 Although you want your child protected from the elements, you also want to make sure he can walk and lift those legs easily on and off a snowmobile. That's why the boot's weight is also important. Many lightweight boots offer excellent warmth and protection. It's important that your child's snowmobile boot keeps the snow out when your child is riding and walking. Many boots have fasteners or extra outer layers to keep the snow from finding its way into your child's boot. When buying a snowmobile boot, make sure it has numerous layers of protection and all crevices are blocked with material or fasteners. You want your child to be comfortable while they trek through the snow. This is why both the softness and warmth of the insole should be considered as well as the flexibility of the outer material. No parent wants to wrestle with a child to get boots on and off: that's why the lace system is so important. A lot of kid's boots utilize simple bungee laces that don't have to be tied and can be easily adjusted. Some also feature sturdy Velcro straps that are simple - even for kids. It's important that your child's boot has proper support for snowmobiling, especially for their ankles. Most boots accomplish this through a mixture of sturdy outside materials and nylon. You also want to make sure the support is not so rigid that it affects your child's comfort. There's a lot to consider when snowmobile boot shopping for your child, but it doesn't have to be a daunting task. Just be sure you have a general idea of what you're looking for, including the style and design, material, insole type, lacing, and size. Don't forget to pay attention to the weight and the temperature the boot goes down to. With these features in mind, you are bound to purchase a great boot that will keep your child warm and comfortable.